As the Pant Devil tossed and turned on the Kauvara Sofa he had been forced to pilfer from a nearby store, he wondered what he was going to do. He had nothing now that his pants were all gone. His pants were his sanctuary. If he couldn’t even seek comfort from his safe haven, what hope was there for him in the rest of the world? The Pant Devil jumped up from the couch. There was no point in sleeping on this hard, unfriendly sofa. He was going out and he was going to find a solution to his problems if he had to give up sleep altogether. The Pant Devil strode meaningfully down the darkened streets of Neopia Central. The streets were empty. No surprises there. Everyone was most likely asleep, in beds or sofas or cushions that felt like home. Well, he was going to find something to help him eliminate that devilish Scorchio if it took him years of aimless wandering throughout Neopia. Well, it turned out that the Pant Devil wasn’t quite cut out for years of aimless wandering. After about twenty minutes of aimless wandering, his stomach started growling. What could he do? There were plenty of shops around that he could steal from. The only problem was that he didn’t feel like stealing anything. Despite what his council thought, the fun of stealing came from the thrill of a close call, and knowing that you’d succeeded despite the overwhelming circumstances. Now that Darling had stolen all of the security, there was no point in stealing. It was as easy as buying something. As he walked into the marketplace, he stopped in front of a small, quaint building. The building was modeled to look like a cauldron, with rustic wooden doors and a chimney. The chimney was erupting smoke into the air, and the lights were still on. Curious, the Pant Devil pushed open the door. He found himself in a small, cozy restaurant of sorts. Hungry pets were sitting in there, sipping at something. The Pant Devil sniffed the air. Soup. Come to think of it, some of the thieves had mentioned surviving off the free food at a place called the Soup Kitchen, but he had tossed the thought away, believing donations to be beneath him. Now that he wasn’t terrified out of his wits, the Pant Devil took the opportunity to take a look at the person in charge. It was a faerie, dressed simply; stirring a large cauldron full of what he figured was soup. She smiled genuinely at every pet that came in, giving them extra-large portions and never hesitating to give out second and even third helpings. “So what is this place?” the Pant Devil asked, trying to sound like someone who had never had to go to a place like this in his life. The result was fairly unsuccessful, as the faerie looked at him doubtfully. That stung, and the Pant Devil had to sit down after hearing that. The Soup Faerie was on him in a flash, holding a bowl of soup in front of him. “Now, there’s nothing wrong with being poor,” she replied, placing the soup on the floor. The Pant Devil shot her a look. “There’s nothing wrong with being poor?” he asked, extremely confused. He had dedicated his whole life was about building up his wealth and becoming successful, and now she was telling him that poverty was nothing to be ashamed of? Life was so confusing; it was a wonder he even woke up in the mornings. The Pant Devil stared at her. “Oh, all right.” He hesitantly grabbed the bowl and took a sip of the soup. Mmm, chutney... and was that asparagus as well? He drank the rest of the soup hurriedly, savoring the intriguing blend of flavors. The soup settled in his stomach, making him feel warm and safe all over. It was amazing what a simple bowl of soup could do for someone. The Pant Devil had come here feeling upset, and now, after one bowl of soup, he couldn’t even remember what was making him so upset! Now he could get home and take a nice long nap in his pile of—oh. The pets started buzzing to each other. “Oh, I understand,” the Soup Faerie said softly. “You’re upset about Darling, right?” The Pant Devil stared at her in astonishment. “I’ve seen the articles in the Neopian Times,” the faerie explained. “Darling’s been stealing all of the publicity from you, am I correct?” The Pant Devil continued to stare at her in astonishment. “And, judging by your current state, I’m guessing that he stole your valuables?” The Pant Devil nodded, wondering how this strange faerie could be so accurate in her statements. “All right, Island Mystic,” the Pant Devil retorted, not caring how rude he sounded. “Can you tell me what to do now? My reputation has already been shattered and I need answers, not vague messages!” This faerie wasn’t anything like he had expected her to be. A few months ago, after pilfering a pair of Seersucker Trousers, he had found a copy of Soup Faerie Book in one of the pockets and read it. In the book, the Soup Faerie had been helpful and kind, never hesitating to tell pets what to do in the case of their struggles. “I’m not going to tell you what to do,” the Soup Faerie replied. “That isn’t what I do. I am here to help feed hungry pets. I can inspire you, but I am in no way qualified to tell you what to do.” The Pant Devil stared at her disappointedly, wondering how those crazy Neopians had conjured a sweet, helpful Soup Faerie out of the sharp, sensible one that stood before him. The book was clearly written by the Neopian who had written those crazy articles about him. “However, I will give you one piece of advice, Pant Devil,” she called out. The Pant Devil turned around to face her. “Soup is much more than just a delicious meal.” The Pant Devil stared at her in astonishment. It was at this point that the Pant Devil decided to leave the Soup Kitchen. “’Do not close off any possibilities,’” he muttered bitterly to himself. “What is that supposed to mean? Am I to show up at the Battledome with a bowl of soup in my hands?” He rolled his eyes to the darkened skies. “I should probably get some new weapons for the Battledome,” he said with another roll of his eyes. “Darling stole all of my—” The Pant Devil froze. He knew exactly what to do. The Pant Devil stood in front of the table, staring straight at the Scorchio. Once he had stolen what was needed, the Pant Devil checked the Notice Board. Right on top was a hefty 5,000,000-neopoint ad. This notice advertised an “exclusive once-in-a-lifetime opportunity” to meet “Neopia’s greatest thief.” The advertisement encouraged all readers to head straight out to Darling’s gaudy Neohome for a chance to get the autograph of and possibly talk to the one and only Darling. After reading this, the Pant Devil hurried out, anxious to catch Darling before the end of the exclusive event. The Pant Devil hesitated. “Oh, all right,” he sighed, shaking the Scorchio’s hand. “Meet me in the Battledome in a few minutes.” Then, smiling to himself at his own nerve, he added, “I can’t wait to see how you’ll take on my rare item.” With a small smile, he walked away, shaking slightly. In a matter of minutes, he would either be regaining his crown as Neopia’s lead thief or be laughed out of town. The thought was slightly intimidating. The Pant Devil circled Darling. This would have to be timed absolutely perfectly, or he would come off as a fool. His hands shaking, he pulled out a glass bottle, careful to keep its contents hidden from Darling. “Say goodbye!” he crowed in what he hoped sounded like a battle cry. This was it. This was the moment he had been waiting for. “What?” Darling asked, staring at the Pant Devil with an alarmed expression. Things were not going according to plan at all. At least not for Darling. The Pant Devil’s plan was actually quite simple. He had bought a bottle of Noxious Nectar. After dumping the contents out, he had come back to the Soup Kitchen and asked the Soup Faerie to fill the bottle with soup. If she had been surprised, she didn’t show it on her face. In fact, she seemed sort of pleased as she filled the bottle, telling him to come back any time if he needed a refill. The Pant Devil promised that he would. That was the easy part of his plan. The tough part was getting Darling in on it. When he arrived at Darling’s Neohome to challenge him, he knew that this part of the plan would not be easy to pull off. He needed to make Darling believe that he had stocked up with an amazingly rare weapon, and he needed to make sure that Darling believed that it held the key to winning. With his statement back at the autograph signing, he figured that he had done it. Darling had tried to steal his weapon with the claw. However, it all depended on whether or not Darling had brought another weapon. Darling, looking concerned, jumped towards the Pant Devil, his legs kicking. The Pant Devil easily moved out of the way. Yes! This was the tricky part. If Darling had brought other weapons, the Pant Devil would have lost. However, Darling had believed that the Pant Devil’s “rare item” would be sufficient to defeat him and had only brought the claw. And judging by Darling’s unsteady fighting stance, he had never fought hand-to-hand before. The Pant Devil had. Learning to throw a punch or block a kick was crucial for thieves, especially when they were starting out. “Enjoy poverty!” And with that, the Pant Devil launched himself towards Darling, launching a fierce attack at him, depleting his health completely. The Pant Devil was back at the Soup Kitchen. After he had regained possession of his pants collection, the first thing that he did was take a nice, long nap. He slept dreamlessly for several nights. However, last night, he had a dream. In the dream, he found himself walking to the Soup Kitchen. However, he was not alone. He couldn’t see the person that he was walking with, but he recognized the long, flowing blue robe. Darling shyly said hello, looking down at the wooden floor. 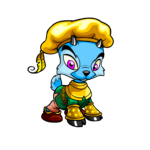 The Pant Devil sat down, nodding hello to the Neopets. He had come back to the Soup Kitchen every day since that fateful day. Now that he had his wealth and fame back, he was not permitted to eat soup, but he still came to talk to the Soup Faerie and the pets. As he came back more often, he began to get to know some of the pets by name. Some of them had been far worse off than he was. Whenever a pet asked him as to how he got to be so successful, he simply repeated the Soup Faerie’s advice: stop looking for solutions. Seek solace with your loved ones and the things that you love, and the answer will come to you when you are ready for it. He had told the pets the story of his conflicts with Darling. However, he had said, he would be bringing Darling here someday. When Darling came, the pets were not to hold any grudges against him. They would treat him with as much respect and admiration as they treated the Pant Devil. And, he was pleased to see, they were treating Darling very well, kindly talking to him and asking him questions about his life. Already, in the course of five minutes, the Pant Devil could see Darling start to open up more. He even saw him laugh a few times. The Pant Devil considered this for a moment. Yes, positive publicity would be nice, especially after all of the negative publicity that he had endured. However, he wasn’t sure of this writer’s merits. And, staring at Darling, he realized that Darling was not nearly the villain that he had seemed to be. And having a negative interview published would surely break their fragile bond. What he was doing now outweighed any of fame’s promises. Of course I had to save the best for last, so this week we are looking are some of my favorite games: Deckswabber vs Stowaway Sting and Dubloon Disaster vs Dubloon Disaster.